The time to drink and be merry has arrived once again in Munich, Germany, as the Oktoberfest kicks into full gear. 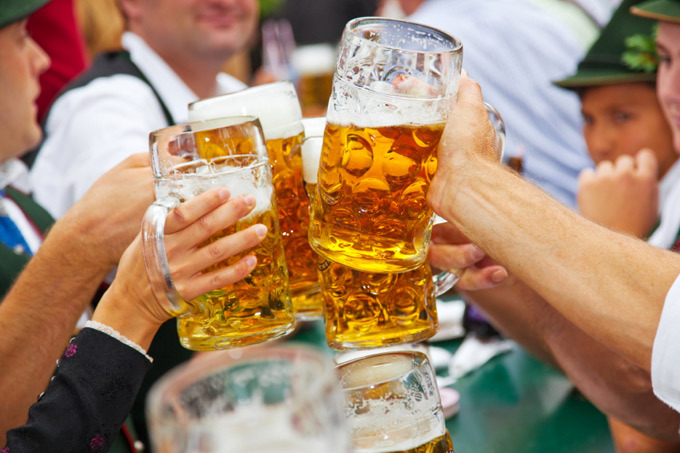 The German locals as well as those who travelled far to participate in the Oktoberfest can feast on a smorgasbord of food served the traditional way, and washed down with big mugs of German beer! The Oktoberfest is the world’s largest beer festival held annually in Munich for 16 days and attracts over six million people every year. About 1.5 million gallons of beer are consumed, together with 200,000 pairs of pork sausages and 480,000 spit-roasted chickens during the two-week extravaganza. My goodness, that’s a lot of food! The festival reinforces a stereotypical image of beer-loving, meat-loving Germans who dress for the occasion in dirndls and lederhosen, but most of the party-loving people are made up of visitors from all over the world. The Oktoberfest is one of Munich’s largest and most profitable tourist attractions, bringing over 450 million euros to the city’s bank books each year! … that the largest Oktoberfest held outside Germany takes place annually in the twin cities of Kitchener-Waterlook in Canada? That’s the residence to a large ethnic German population. … that the largest such event in the United States is the Oktoberfest-Zinzinnati in Ohio, which boasts half a million visitors each year! Phew! Oktoberfest: A festival of food, fun, and frolic under the beer tents. Photo by DrinkStuff (Beer Festivals). 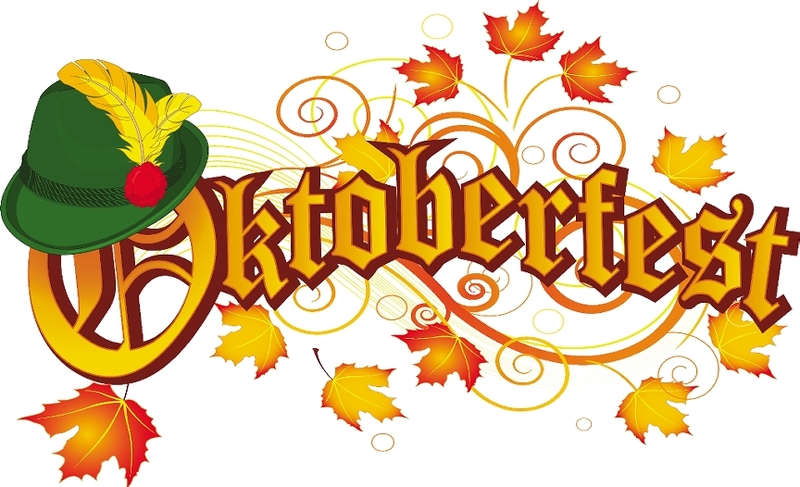 The first Oktoberfest began on October 12, 1810 after the marriage of Crown Prince Ludwig (who became King Ludwig I) to Princess Therese von Sachsen-Hildburghausen in Bavaria. Five days after the marriage, a large festival was held in front of the Sendlinger Tor, one of the gates leading to Munich. The festivities included horse races that eventually became an Oktoberfest custom until 1938. An agricultural fair was added in 1811, and the first carousel, two swings, and beer pubs were included in 1818 along with performers. Oktoberfest gradually became a great tourist attraction and a way for visitors to learn about Bavaria and its people. In 1887, lederhosen and dirndls became the traditional attire of the Oktoberfest attendees. Beer tents and halls set up by enterprising landlords with the backing of the breweries replaced the beer stands in 1896. 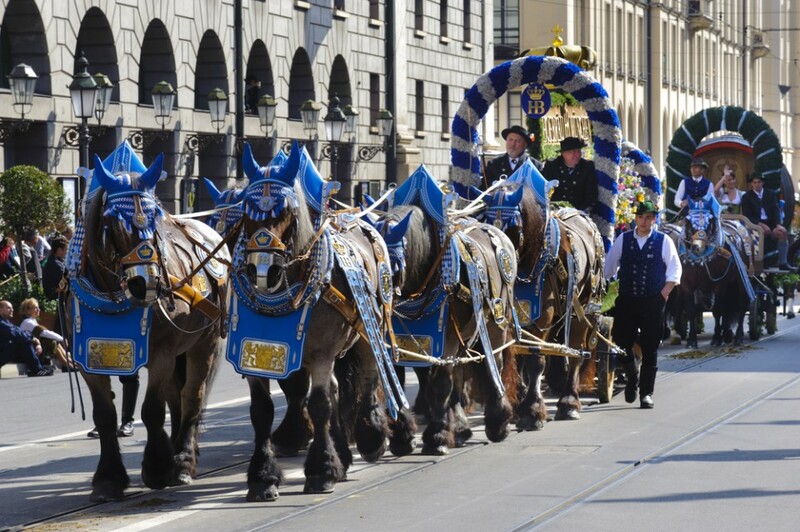 Horse-drawn brewer carts during the Oktoberfest parade. Photo by The Travel Republic Blog. The festival may have begun in October, but it is now held in September as the weather is milder then as compared to October. The festival lasts for 16 days, beginning on a Saturday in late September and ending on the first Sunday in October. Oktoberfest traditionally begins with a parade before noon, which includes the participation of the mayor and other civic leaders, followed by horse-drawn brewer’s carts, bands, and the townspeople wearing their costumes. The parade ends at the oldest private beer tent, the Schottenhammel tent, where the mayor opens the first keg of beer to kickstart the festival, and the toasting begins. The opening ceremonies are usually attended by more than 7,000,000 people. The remainder of the festival site provides the space for a funfair. At the foot of the Bavaria Statue, there are carousels, roller coasters, and all the spectacular carnival rides for the enjoyment and excitement of the public. The festivities are often accompanied by music and dancing, followed by a program of events, including the Grand Entry of the Oktoberfest Landlords and Breweries, the Costume and Riflemen’s Procession, and a concert that involves all the brass bands represented at the “Wiesn”. The big mugs of beer at the Oktoberfest in Munich, Germany. Photo by Jillian Wilson (uwishunu). The festivities are not just the highlight of the Oktoberfest. The endless flow of beer and the wide array of food prepared for the partygoers make up the rest of the festival. The Oktoberfest beer is an amber-gold coloured lager with six percent alcohol with the addition of German hops such as Hallertau and Tettnang. Six major Munich brewers known to take part in the festival are Hacker-Pschorr, Lowenbrau, Spaten, Hofbrauhaus, Augustiner, and Paulaner. They can be found in the seven halls where live music can be heard from all throughout the day. The variety of food served during the Oktoberfest is far and wide, and includes meat such as beef, chicken, veal, and pork, as well as sauerkraut, potato salad, cabbage, onions, and pretzels. This has been an entertaining Oktoberfest session, don’t you think? All this talk about food and drinks has made me hungry. 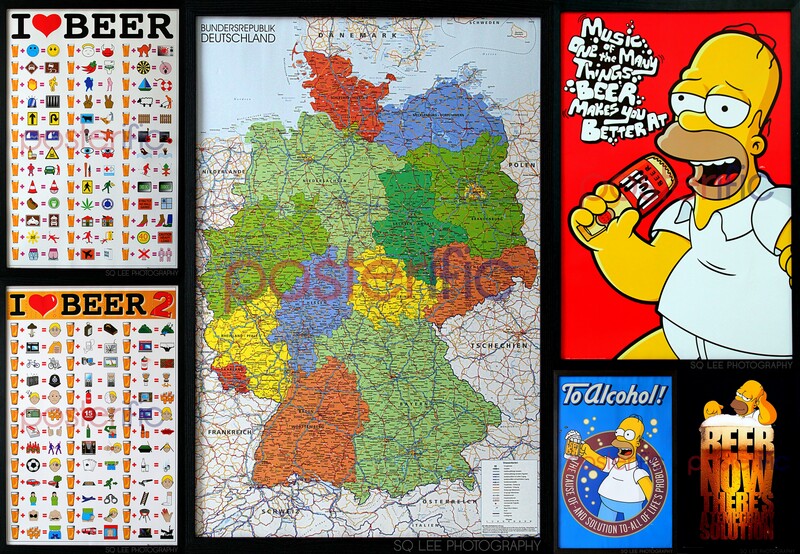 For all the beer-lovers out there, we have posters on them as well as the country where Oktoberfest and beers originate from, and not to mention, our favourite cartoon character, Homer Simpson! He who drinks the most beer and still lives to tell his tale. Drop by our physical store at Taylor’s University Lakeside Campus or our Facebook page to get your beery posters! We’ve talked about posters, liking posters, and buying posters! But what is it about posters that we love so much? Is it the various colours, or the intricate designs, or the patterns and images that evoke imagination in our heads? Then we heave a sigh of contentment once we’ve bought them. It’s amazing how far we would go to buy our favourite posters, how much we would fork out just to buy them for our rooms. Who was the genius who invented this rectangular piece of happiness? The first posters were created in France in the mid 19th century as advertisements for new products, theaters, opera shows, and major events in Paris. In less than ten years, the use of posters spread from France throughout the rest of Europe. 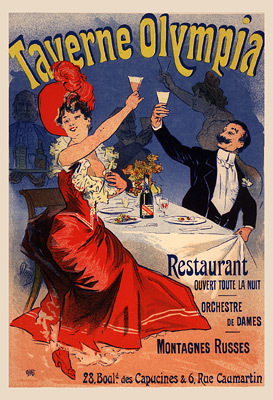 Taverne Olympia (1896) by Jules Cheret the ‘Father of the Poster’. Photo by WikiArt. … that the first poster was invented by a Frenchman named Jules Cheret (image above) ? In 1867, Cheret, who was also known as the ‘Father of the Poster’, made the poster by using a four-colour lithographic process to create a highly stylized form of graphic art that intricately integrated texts and images onto a piece of paper. In 1867, Jules Cheret was the first modern poster artist who created a theatrical poster entitled ‘Taverne Olympia’. His captivating depiction of the Parisian nightlife and its entertainers rendered in clear and radiant colours dominated Parisian displays for the last 30 years of the 19th century. Apart from Cheret, two other Frenchmen by the names of Henri de Toulouse-Lautrec and Pierre Bonnard also designed numerous posters during the 19th century. The invention of the printing press relied on graphic arts, and paved the way for mass production of posters of various shapes and sizes. The method used to print posters is called ‘lithography’, by placing ink on a series of metal or stone (lithos) carvings, which are reliefs of coloured regions on the poster. In 1889, Jules Cheret, the creator of the first poster mentioned above, was awarded the Legion of Honor for creating a “new branch of art”. Posters were one of the earliest forms of advertisements and only in the 19th century were they developed as a medium for visual communication. The term ‘poster’ is described as a paper panel printed for display as a work of art. But posters did not exist until around 1860 (during Jules Cheret’s time) when the invention of lithography paved the way for the cheap and easy production of brilliantly coloured posters. The invention of posters influenced the development of typography because they were meant to be read from a distance and this meant larger type of fonts had to be produced, usually from wood instead of metal. 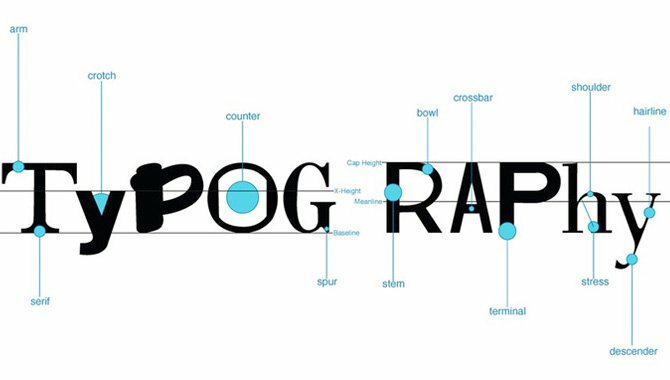 The development of typography was influenced by the invention of posters. Photo by Inspired Mag. Posters eventually became a staple of the graphic design trade and its purpose expanded to being used as promotion of propaganda for various political parties, recruitment of soldiers, advertisements of products, and to spread ideas to the general public. Posters became the most effective tools for communication and their contributions to the design industry arose from efforts to create the perfect poster. Today, the popularity of internet posters are still being created for a wide variety of reasons. Posters quickly gained notoriety in the modern world, and are seen as eye-catching and informative media. They are frequently used as advertisements for events, musicians, and films, and to an extreme extent, as propaganda and political reasons as a means to communicate a message to the public. 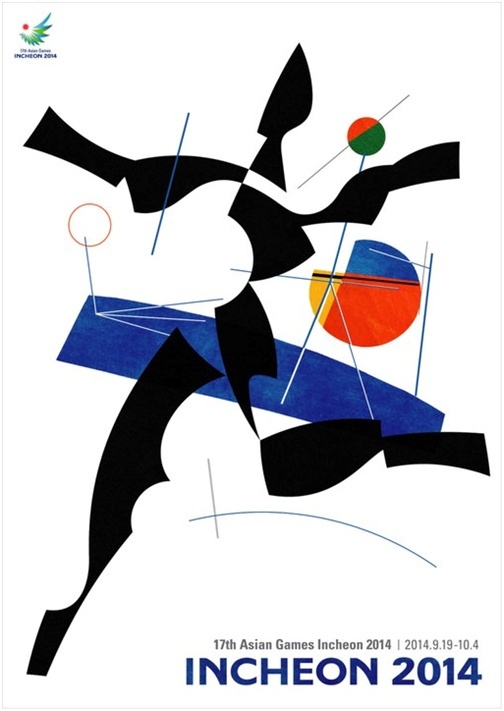 These days, posters are also used for reproductions of artwork, especially famous works with respect to the copyright laws, and are generally low-cost compared to the original pieces of artwork. All this talk about posters is making me feel like going out there and buying a poster. What about you? Drop by our store at the Taylor’s University Lakeside Campus to have a look at the posters we have, or feel free to browse our extensive collection on our Posterific Facebook page! The thought process begins the moment you buy a poster or two (or more!) from our store. Once you have paid and start to walk away, you mentally ask yourself, how are you going to put your posters up without it falling off the wall and getting crumpled on the floor? The next question baffles you just as much: How are you going to maintain the condition of your posters after you’ve bought it? Because you love the posters so much and because you’ve invested a lot of money in them, the last thing you want is a spoilt purchase. 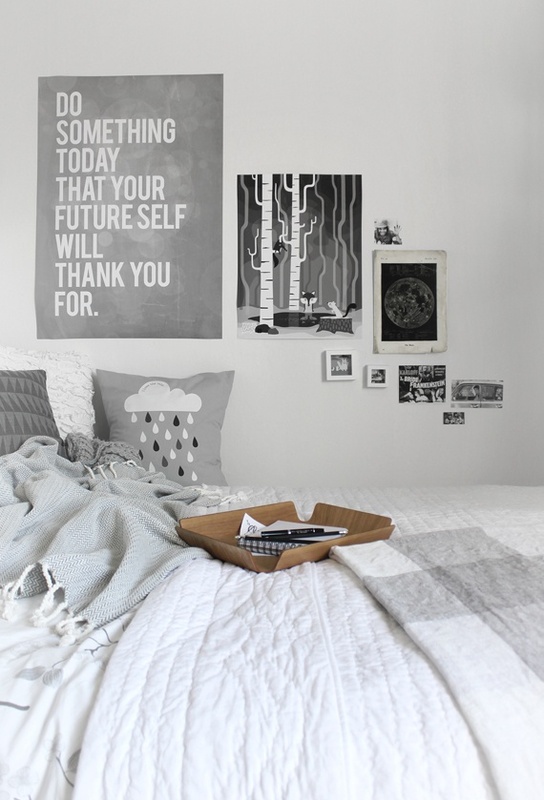 Posters mounted on a bedroom wall. Photo by Mira Moln via Pinterest. Look no further, for we are here to save the day! Sort of… Below are some tips that we would like to share with you on how you can keep your posters in good condition after you’ve bought them, as well as what you can use to put them up without having them fall off the wall. Avoid soggy posters – Do not display posters below air-conditioning units to avoid water droplets that drip down walls. Tacks and tapes – To ensure that your posters don’t fall off the wall and lay crumpled on the floor, we suggest using blutack (if you are permanently based at the place), strong cellophane (folded into circles one end to the other, leaving the sticky sides out) or poster hanging tape (strong enough adhesive for your posters which doesn’t peel paint off the walls) for temporary placements. All hooked up – Alternatively, you can use hooks that are attached and secured to walls using nails and/or screws. These are useful if you have bought framed posters. But you may have to get permission from your landlord or landlady, or even your parents, before you put them up. Rolled and protected – If you are not using your posters, we recommend that you roll them up and store them away in their tubes. These tubes are provided upon purchase at our store. Plastic pockets – Alternatively, you can place your posters in transparent plastic-sleeved cardboards. This way, your posters can still be displayed without being mounted directly onto the wall. These cardboards are available at our store for RM4.00 apiece. Get more posters from us at our store at Taylor’s Lakeside Campus or via Posterific Facebook! This Friday, the world will tune in to live telecasts of the opening ceremony for the 17th Asian Games 2014 that will be held in Incheon, South Korea from September 19, 2014 to October 4, 2014. The opening ceremony will start at 5:00pm (Malaysia time) on September 19 with the showpiece event of various performances exemplifying the elements of Korean traditional culture and their latest technologies. Athletes from all participating nations will be a part of the event, marching past their respective contingents on this very day. Even important officials from Asian countries will attend the opening ceremony. 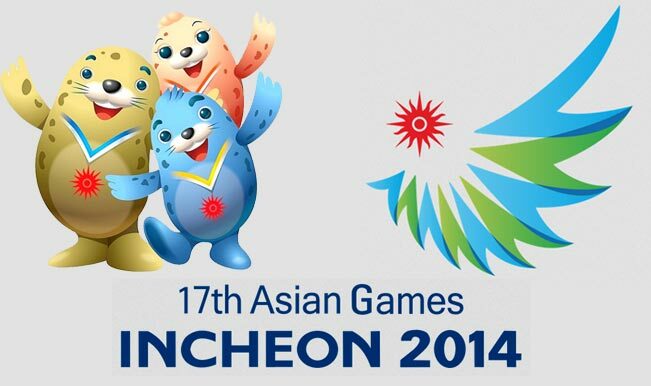 Official poster and three seals mascot for the 17th Incheon Asian Games 2014. Photo by India.com. Similar to the Olympic Games, the Asian Games is held every four years and is the most prestigious event organized by the Olympic Council of Asia. The Asian Games follow a similar arrangement of the sports programme to that of the Olympics, with swimming and athletics at the core, while featuring disciplines in the diverse sporting culture of the continent, such as sepak takraw (Southeast Asia), kabaddi (South Asia), and wushu (East Asia). The first and foremost Asian Games was held in New Delhi, India, in 1951 with 11 countries competing in six sports categories. The 16th Asian Games took place in Guangzhou, China, in 2010 and featured 45 countries and regions competing in 42 sports categories. As a result, the growth of the Olympic Movement in Asia was highlighted. Now the 17th edition of the Asian Games will be held in Incheon, South Korea with 439 events in 36 sports categories and disciplines. 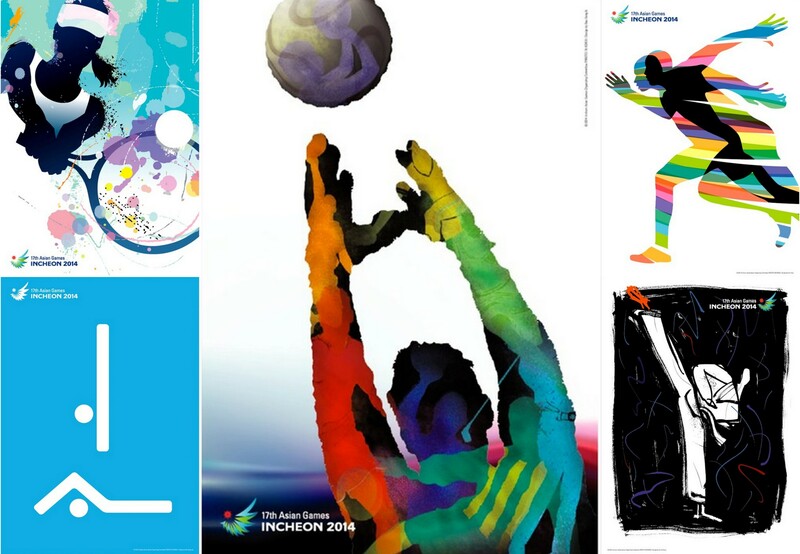 The official poster of the Incheon Asian Games 2014. Photo by IAG14 (Blog). The Asian Games 2014 is officially known as the XVII Asiad. ‘Diversity Shines Here‘ is the official slogan of the Asian Games which was unveiled on September 16, 2010. The official slogan represents and highlights the significance of Asia’s rich and wonderful diversity in history, cultures, and religions. Incheon was awarded the right to host the Games on April 7, 2007, after defeating New Delhi, India. It is understood that Incheon made an offer to raise USD$20 million of funds to support the countries who have yet to win a medal in the Games, as well as offering free flight and accommodation to all the participants, while India offered nothing, which led to the South Korean city to win the right to host the Games. Incheon is the third city in South Korea after Seoul (1986) and Busan (2002) to host the Asian Games. Other official posters depicting five games (racquet – top left corner / aquatics – bottom left corner / ball – middle / athletics – top right corner / combat – bottom right corner). Photo by IAG14 (Blog). Malaysia is one of the 45 nations participating in the Incheon Asian Games 2014, with core focus on top local sportsmen and sportswomen like Lee Chong Wei (badminton) and Nicol David (squash). National hockey coach A. Arulselvaraj hopes his unorthodox ways of blaring Pink Floyd music on the loudspeakers will motivate, encourage, and inspire his team to a gold medal. Low Wee Wern from the national squash team hopes to have an all-Malaysian final in the Incheon Asian Games 2014 with World No.1 Nicol David. But she will have to wait and see what happens when Nicol David takes the squash courts by storm. The Malaysian Tiger footballers defeated Laos 4-0 in their second Group A match to stay afloat for their stint in the Incheon Asian Games 2014. And Datuk Lee Chong Wei will be looking to add more gold medals to his current tally as he prepares to wow his legion of Malaysian fans in the Asian Games. Chong Wei’s badminton counterpart Chong Wei Feng is relishing a left-handed battle with his childhood idol and China’s Lin Dan. No doubt everyone will be hoping for a bigger haul of medals for the nation this time. Malaysia Boleh! And Jimi Hendrix got what he wished for. At only 27 years old, Hendrix was young when he died on September 18, 1970 from drug-related complications. A talented recording artist, an accomplished songwriter, and a musical experimenter, Hendrix left his mark in the world of rock and roll, and remained popular until today. His passing led to a realization that he was the ultimate guitar player, and that he made use of the electric guitar more than anyone. A 3-in-1 Rock Star. Just add a guitar: Jimi Hendrix, short for James Marshall Hendrix, was born as Johnny Allen Hendrix. Photo by Cinema Arts Centre. 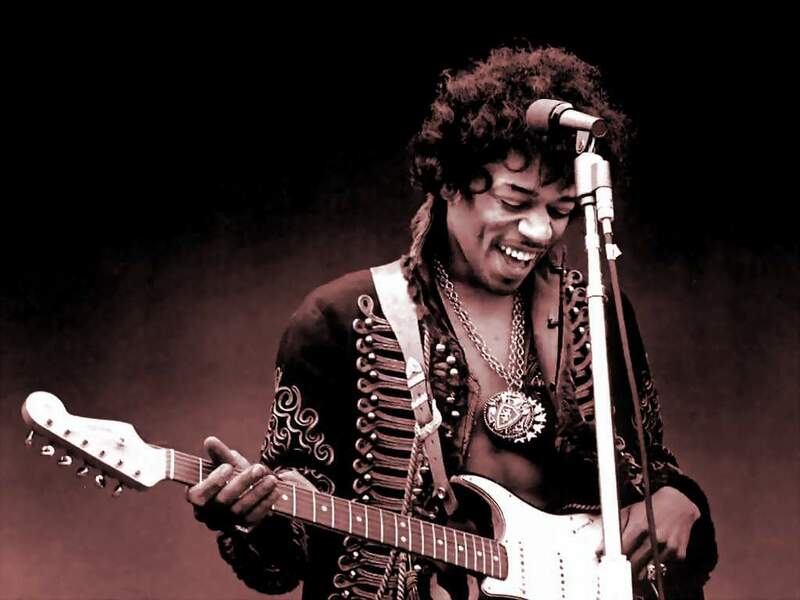 Jimi Hendrix was born Johnny Allen Hendrix (later changed to James Marshall Hendrix), and learned how to play the guitar during his teenage years. He was destined to become a legendary rock star when he grew up, and his dreams came true in the 1960s, rocking the world with his innovative electric guitar-playing skills. A rock version of “The Star Spangled Banner” was one of Hendrix’s most memorable performances at in Woodstock (1969), dazzling the crowds with his musical talents. He survived a difficult childhood which sometimes involved living with relatives and acquaintances. His parents had a stormy relationship despite having three boys (Hendrix and his two brothers, Leon and Joseph). His mother was only 17 when Hendrix was born. His father was present during his childhood years but did not care much for his sons. Hendrix’s mother eventually left the family, whom Hendrix only met sporadically before she died in 1958. Due to his shattered childhood, Hendrix turned to music as an outlet for his emotions and taught himself to play the guitar. At 14, Hendrix attended his first concert performance by Elvis Presley. A year later, he got his first electric guitar and played with two bands – the Rocking Kings, and the Tomcats. In 1959, Hendrix dropped out of high school and worked odd jobs while keeping his musical dream alive. In 1961, Hendrix enlisted in the U.S. Army and trained at Fort Ord, California, to become a paratrooper. Even though he was in the army, he still made time for music, and created a band called The King Casuals. In 1962, he was discharged due to an injury and pursued his musical aspirations by working as a session musician. His role as a backup guitarist for performers such as Little Richard, Sam Cooke, and the Isley Brothers paved the way for him to form his own group called Jimmy James and the Blue Flames. They played gigs around the neighbourhood of New York City’s Greenwich Village. The band’s first single, Hey Joe, released in 1967, became an instant hit in Britain, followed by Purple Haze and The Wind Cried Mary. That same year, Hendrix delighted audiences with his outrageous guitar-playing skills and his innovative, experimental sound while on tour to support his first album, Are You Experienced?. His stunning performance at the Monterey Pop Festival in June 1967 (which ended with Hendrix lighting his guitar on fire) won the hearts of many American music fans. Other 1968 hits by Jimi Hendrix included: Axis: Bold as Love from his second album, Electric Ladyland from his final album as part of the Jimi Hendrix Experience, and All Along the Watchtower from the same album, written by Bob Dylan. In 1969, the group disbanded and Hendrix tried his luck with another group, Band of Gypsys with his army buddy Billy Cox and drummer Buddy Miles. They didn’t get very far, and Hendrix decided to work on a new album called First Rays of the New Rising Sun with Cox and Mitchell from the Jimi Hendrix Experience. Sadly, Hendrix didn’t live to complete his project and was found dead in Notting Hill, London from a combination of alcohol and substance abuse. It is indeed devastating when you learn of the passings of your idols, be it superstars on the big screen or singer-songwriters of their time. You can show your love and support for Jimi Hendrix and get your version of the Hendrix experience by getting your posters from our us. 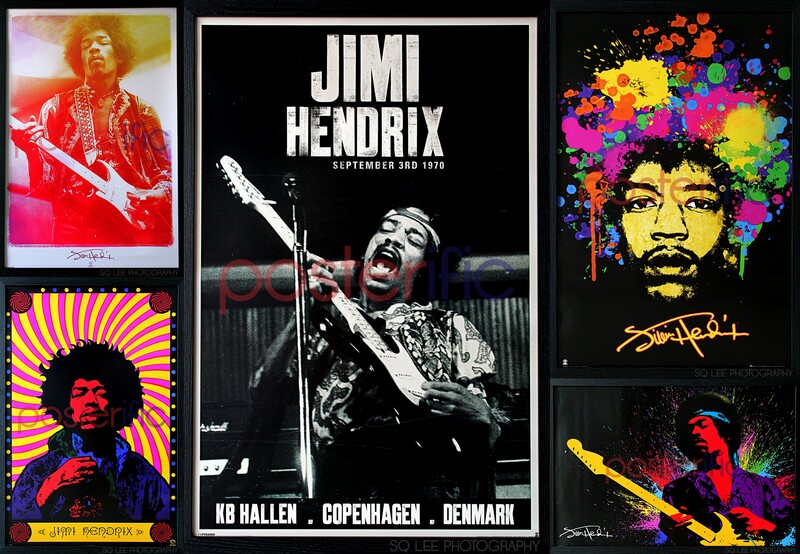 Click here for our Jimi Hendrix poster album. It’s understandable that most Malaysians can only associate with National Day which is celebrated annually on August 31. After all, it is a nation-wide event that has been marked as important to us ever since we gained independence on that fateful day. Happy Malaysia Day! 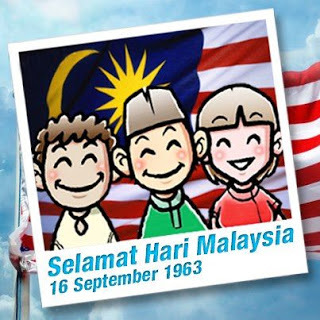 (Selamat Hari Malaysia!). Photo by Say U Lov Me (Blog). The plan to officially declare the formation of Malaysia was initially dated August 31, 1963 to coincide with the sixth anniversary of the Malayan Independence. The formation of the country had initially included Sabah, Sarawak, Malaya, and Singapore. Due to issues surrounding the Indonesian and Filipino objection to the formation of Malaysia, the date was postponed to September 16 that same year. Another reason given for the postponement of the date was to allow the United Nations time to conduct referendums in Sabah and Sarawak regarding the two states’ participation in a new federation. On September 16, Tunku Abdul Rahman was given the title “Bapa Malaysia” (Malay for “Father of Malaysia”), and the national flag was raised for the first time in all 13 states (11 Peninsular states and two from East Malaysia). The formation of Malaysia was successfully made through the introduction of the Malaysia Bill to the Malayan Parliament on July 9, 1963 and consent from the Yang di-Pertuan Agong on August 29, 1963. However, on August 9, 1965, Singapore officially announced its separation from Malaysia to form an independent nation on its own. This year marks the 51st anniversary of Malaysia Day, so let us all celebrate this national event together with all our heart and soul. Happy Malaysia Day everyone! From us at Posterific! On September 11, 2001, two planes were hijacked by terrorists and flown straight into the Twin Towers of the World Trade Center in New York. The towers crumbled, crushing the occupants of the towers as well as killing scores of innocent bystanders on level ground and those who were nearby. A third plane intended for the White House changed its flight course and crashed into an open field after the passengers onboard fought back. A fourth plane was flown straight into the Pentagon. It was the darkest day for the Americans, and those who survived, lived to tell the tale that they had seen with their own eyes. Those who have gone to lend a hand to help out included the brave firemen and policemen, and while they were able to rescue others, some of them have lost their lives in the aftermath of the incident. The devastating attacks were caught on public television, shocking every other nation who tuned in to their local news channel and watched the whole event unfold before them. 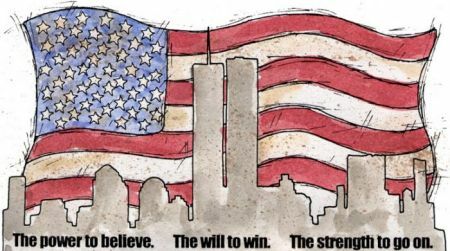 9.11.2001. The power to believe. The will to win. The strength to go on. Photo by Vicki Blackwell. Today, we remember the brave firefighters who lost their trying to save people who were trapped beneath the rubble. Today, we remember the courageous policemen who lost their lives trying to contain the terrorists and hijackers from attacking elsewhere. Today, we remember those who lost their lives after being trapped in the towers as they desperately tried to escape, the innocent bystanders who lost their lives despite being outside the Towers, and the families who lost their loved ones in the horrific incident. Today is the 13th anniversary of 9/11 (as it is fondly known as today). Today, we put our differences aside and pray for the victims and their families.